Terry Winschel, long-time historian at Vicksburg National Military Park, recently retired from the National Park Service. His illustrious career included serving as a Licensed Battlefield Guide at Gettysburg. He is the author of innumerable articles, and a long list of books on the Civil War, including The Civil War Diary of the Common Soldier, Triumph and Defeat: the Vicksburg Campaign (2 vols), and Vicksburg: Fall of the Confederate Gibraltar. His article, "Vicksburg Campaign: Unvexing the Father of Waters," can be read at The Civil War Trust website. DW: Congratulations on your retirement. How many years did you serve at Vicksburg National Military Park, and how many different roles did you have there? TW: I began my association with the National Park Service in the summer of 1976 when I served as a Licensed Battlefield Guide at Gettysburg National Military Park. The following summer I landed a seasonal park ranger job at Gettysburg and have from that date been continuously employed by the NPS until my retirement in August 2012. From Gettysburg I went on to serve seasonal appointments at Vicksburg, Fredericksburg, and Valley Forge, after which I became a full-time employee of the NPS at Vicksburg and spent my entire permanent career in Mississippi. Initially I served as an interpreter at Vicksburg manning the park's information desk and sales area, doing interpretive programs, and served as a member of the park's summer living history cannon crew. In 1988, however, the position of Historian was re-established and I was fortunate enough to be selected. It was the position in which I served for the duration of my career. 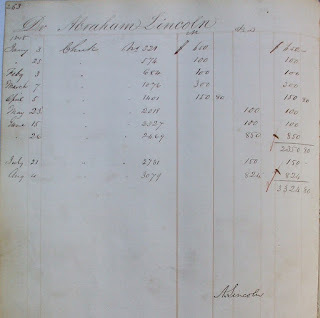 The duties of that position were diverse and included managing the park's extensive archival, photographic, and map collections, the park library, and assisting researchers. They also entailed conducting Staff Rides for the military, tours of the campaign area for CWRTs, speaking at CWRTs and at academic symposia, helping to guide the park's interpretive operations, and drafting publications such as brochures and site bulletins. In addition to the "official" duties and responsibilities I was allowed to take charge of the park's land acquisition program, serve as sexton of Vicksburg National Cemetery, was the park's public relations officer, and coordinator of the park's sales area. I also worked closely with the chief of maintenance on an array of projects from battlefield and monument restoration, to roads and bridges maintenance, to preservation of historic structures. Thus, as park historian, I wore many hats—as many as I wanted juggle. DW: I have often thought about what it would be like to be so intimately connected to a battlefield, for such a long period of time. You've been eating, sleeping, and breathing Vicksburg for so long, is it even really possible to "retire"? TW: No it is not. Since my retirement I have been and will continue to conduct tours of Vicksburg and other battlefields across the nation, write a weekly column for the local newspaper on the Vicksburg campaign, and have a full writing plate for articles on the Vicksburg campaign for numerous periodicals. I also remain very active on the speaking circuit and this year will appear before a dozen CWRTs across the nation and speak at several academic seminars. I am also working with an array of partners at the federal, state, and local levels on battlefield preservation initiatives throughout the Vicksburg campaign area as well as at battlefields in a half-dozen other states. 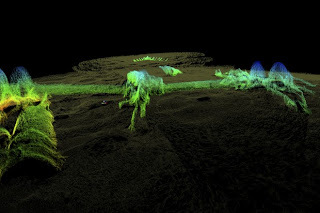 An exciting project that is currently underway is working with the Civil War Trust to develop a phone app on the Vicksburg campaign that will feature scores of "Virtual Signs," numerous videos, and animated maps of the campaign. DW: What are some of the things you are most satisfied about accomplishing during your tenure at the Park? Were you able to increase the Park's holdings, influence the way the grounds were interpreted, restore historic areas? TW: Among the accomplishments I'm proudest of are the permanent additions to the park. Over the years I drafted several pieces of legislation relative to Vicksburg that were passed by Congress authorizing boundary adjustments. 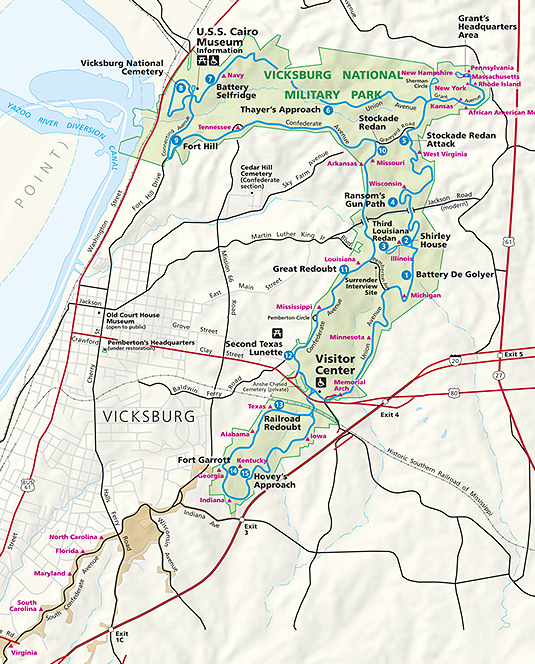 As a result, the remaining vestige of Grant's Canal and Pemberton's Headquarters are now part of the park, and approximately 3,000 acres of land are preserved on sites associated with the Vicksburg campaign, but not under the jurisdiction of the NPS. Seven new state monuments were added to the park during my tenure as historian—the process for which took years. In addition, many of the park's other state monuments were restored during those years, the combined costs of which was millions of dollars. I helped lay the ground work for the current battlefield restoration initiatives, assisted in the development of the park's current audio visual offerings, greatly expanded the park's archival, curatorial, and library holdings. In my final years with the agency, I worked diligently to preserve and enhance the hallowed grounds of Vicksburg National Cemetery. But my proudest accomplishment was keeping faith with the veterans themselves, the men who not only fought and died at Vicksburg, but those who labored to establish the park and make it an American shrine. And the greatest joy came from serving the visitors and making countless friends across the nation who share a similar passion for history. DW: Is there an important story about Vicksburg that still needs to be told? TW: Yes, there is still so much that needs to be told. The story of Vicksburg's civilian population, both black and white, needs more light shined upon it, especially as it deals with Union occupation during the Civil War through Reconstruction. Confederate relief operations under Joseph E. Johnston and the efforts of the Trans-Mississippi Confederates to come to Vicksburg’s assistance is worthy of more than a chapter in most books on the campaign. Intelligence and counterintelligence operations during the campaign played more of a role than people know of and should be addressed by a worthy pen. The Battle of Milliken's Bend needs a full-length treatment, as too does the history of commemoration and the establishment of Vicksburg National Military Park. 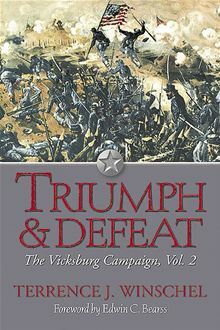 An atlas of day-to-day operations during the campaign is among the biggest voids in available literature on Vicksburg. And, of course, the naval story and its leading figures must be addressed more than in passing. DW: Have you read the manuscript for Michael Ballard's forthcoming book, Grant at Vicksburg? 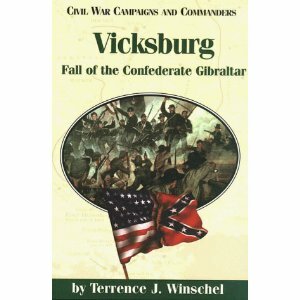 And if so, what can we expect from one of the few Vicksburg sesquicentennial books on the docket? TW: Yes. It is excellent! Not wishing to let the cat out of the bag, suffice it to say that readers will be well-pleased, especially those who think there is nothing new on Vicksburg about which to write. Mike has certainly established himself as Mississippi’s foremost authority on the Civil War in the West. 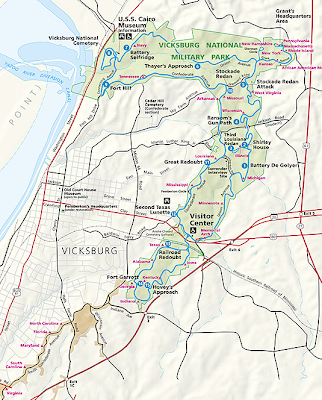 DW: Will you continue to research and write about Vicksburg? Anything in the works at present? TW: Definitely. In addition to the app for the Civil War Trust, I am currently working on two magazine articles. As soon as the sesquicentennial observance is over here at Vicksburg and things slow down a little in terms of programs and tours, I plan to get back to work on the books I want to write. There are three in particular that I want to write and truly pray that I will complete them someday and leave them as part of the lasting legacy that honors those who wore the blue and gray. Researching and writing is a joy. . . .At present. DW: What's in store for the sesquicentennial next summer? Should we all plan a visit? Painting of the H.L. Hunley by Conrad Wise Chapman, dated circa. 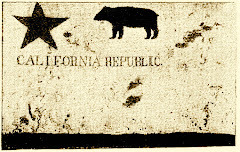 1863-64. The 17th annual CompuServe Civil War Forum Reunion is occurring in Charleston, SC this year. We have about 30 people signed up so far -- all are welcome, whether you participate in the Forum or not. We'll cut off registration at around 45 (one bus load). $295 registration includes a seat on the bus, entrance fees to all locations (including museums and ferry ride to Fort Sumter), buffet dinner Friday and Saturday evenings, and box lunches for our Friday and Saturday outings [does not include lodging]. All monies over expenses to be donated to the Civil War Trust. See a tentative itinerary and registration information here. For more information, contact David Woodbury at civilwarforum[at]mac[dot]com. 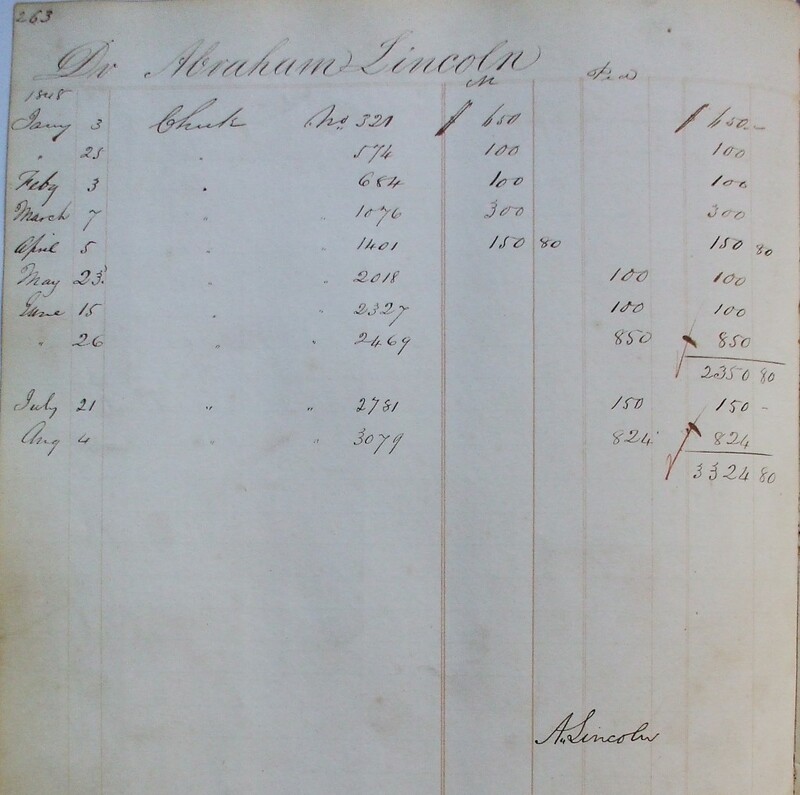 There's an utterly fascinating post, by David J Gerleman, at the National Archive Prologue blog on the search for Lincoln's Congressional pay records. I love Treasury Department treasure hunts.